Dental implants look and feel like real teeth. If your dentist in Pawleys Island has recommended dental implants as a solution to missing or damaged teeth, there are a few things you should know about the procedure itself and the aftercare. 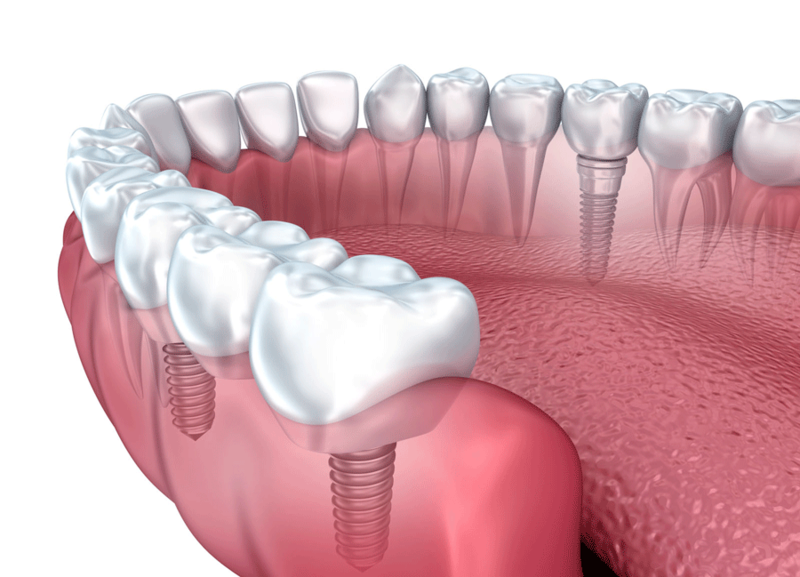 A dental implant is comprised of a titanium post that’s covered by a crown. Your Pawleys Island dentist will integrate the post into your jawbone, allowing the crown to function and feel like a natural tooth. A dental implant can be used for a single missing tooth, or multiple implants can be performed for a full or partial mouth reconstruction.The structure of dental implants means you don’t have to use any other form of stability to hold them in place. Dental implants are designed to last a lifetime, so if you want to make a permanent correction to your teeth, this is an option to consider. Consider these benefits to choosing implants for your dental procedure. Clean like natural teeth: Unlike some tooth replacement options – like a dental bridge or dentures – dental implants do not come out and you brush them just as you do your natural teeth. Function like natural teeth: Dental implants allow you to eat the foods you love rather than sticking to a soft foods diet. The titanium post is secure, so hard, chewy or sticky foods won’t be a problem. Look like natural teeth: There is no visible metal and the crown is created to match your tooth shade. No one will be able to tell you’ve had dental implant surgery. Reduce bone loss: In the spaces where you have a missing tooth, the underlying bone can weaken, loosening other teeth and causing them to also fall out. Dental implants improve your bone tissue, avoiding future tooth loss. Pawleys Island dental implant surgery is typically done in two or three phases, depending on your oral health. In the first phase of the dental implant procedure, the implant is surgically placed inside the gum and a screw is placed inside the implant. The gum is then secured over the implant and given three to six months to fuse with the jawbone. In some cases the post is added into the implant in phase one. The second step is for your general dentist to uncover the implant and add a post (if the post wasn’t added in the first step). Once healed, the third step can begin. Your dentist will create a unique crown and attach it to the implant post. The custom crown looks and feels like your own tooth. The first follow-up visit after dental implants will be within one to two weeks. Your Pawleys Island dentist will check for proper healing and tissue development. A second visit will be needed about six weeks after the procedure and the third visit roughly six weeks later. X-rays will ensure bone levels are stable and the implants have healed properly. Dental implants are designed to last a lifetime. With routine dental checkups, dental implants can restore your smile and confidence.